LOOK IN PHOTO ALBUMS PAGE AND CLICK ON CITY OF MANITOU ALBUM TO VIEW LOTS OF HISTORICAL PHOTOS OF MANITOU! Located in Tillman County, Manitou is situated eight miles north of the county seat of Frederick on U.S. Highway 183. A few families lived in the area by 1902, and a post office was established on January 29, 1902. In 1903 Marion Barnes, who had land north of the Indian Base Line, and Frank Palmer, who had land south of the Base Line, offered eighty acres for a townsite. A plat was filed in June 1904. In 1903 the Blackwell, Enid and Southwestern Railroad (later the St. Louis and San Francisco Railway) built their lines through Manitou. 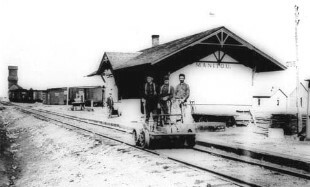 Before a railroad depot was built in October 1905, a platform with a hook served as the delivery point for Manitou's mail. Locals called a meeting to choose a name for the town. A legend emerged that a man from the north had come into the territory, and when he returned from the trip, he was asked what he saw. He replied, "A man or two." Names were submitted and placed in a hat, and the name Manitou was drawn. However, Manitou is an American Indian name given to a great spirit or to an object of worship. 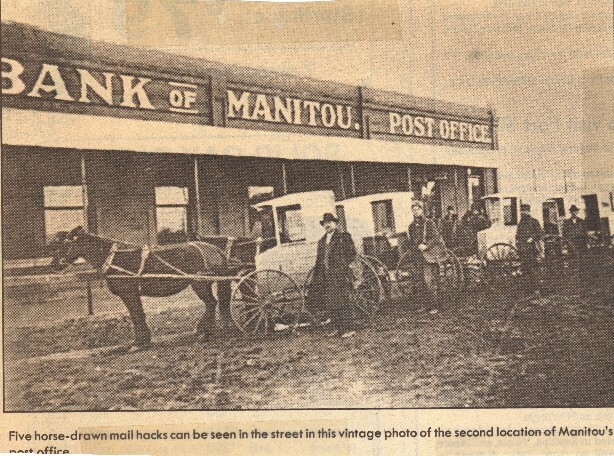 Manitou is the only town in Tillman County that was not named for a railroad company official or by the postal service. In early years several schools were constructed, and the Baptist, Christian, and Methodist churches were organized. In January 1907 the townspeople of Siboney, located two miles north, agreed to move their businesses and residences to Manitou, thus eliminating the rivalry that had existed between the two towns. At 1907 statehood Manitou's population stood at 394. 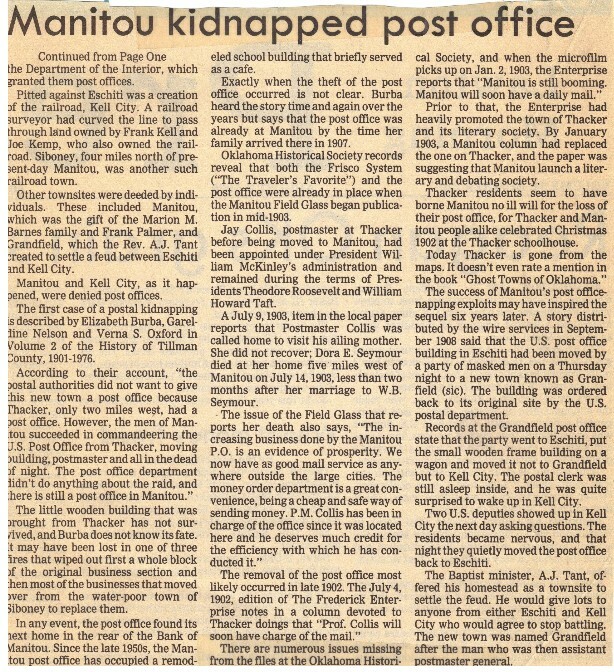 Citizens subscribed to early newspapers such as the Manitou Field-Glass and the Manitou Monitor. 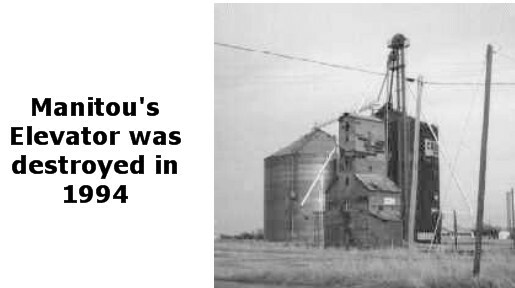 By 1918 three cotton gins and one grain elevator serviced the surrounding agricultural area. At the turn of twenty-first century Manitou, a "bedroom" community, had a population of 278. 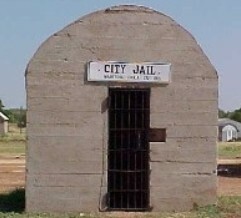 The jail, a small concrete building completed in March 1922, remained standing as a landmark, attracting tourists who stopped to take pictures. The community name derives from Algonquian term for "god" or "spirit"
The estimated population, in 2003, was 271. The approximate number of families is 115. The amount of land area in Manitou is 0.816 sq. kilometers. The distance from Manitou to Washington DC is 1316 miles. The distance to the Oklahoma state capital is 108 miles. Manitou. The earliest settlers arrived in the area between 1901 and 1902. It's name drawn from a hat, Manitou is the only city in Tillman County not named after a railroad or post office official. 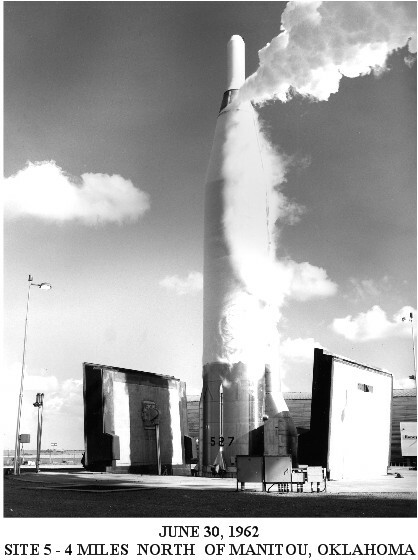 Manitou was built on the "Base Line," or "Indian Base" that runs east and west from the Initial (survey). All places and acres in Oklahoma, except the panhandle, are measured from this point. The first passenger service to the town began in 1903. It's 175,000 gallon water tower was built in 1911 and served as an anchor to prevent Manitou from joining many other ghost towns on the prairie. As for the School, 1/2 mile West of where I lived and about 4 north was the school that all the Stolls and Barkers went.. it was Called Horse Creek School. I can't remember where Glendale was?? Many years ago there was a school 1/2 Mile West and about 2-4 South of Uncle Ben Stoll's road. Same Road that Sherman Woods lived on. As for the Bus Route that I lived on. If you are two miles south of the baseline and 1 mile west that is where Melvin Johnson's lived. Then going back east about 1/2 Mile on the South side of the road and about 1/4 mile in lived Hardy Watson. Then if you keep going about a mile east of Hardy's and down on the Creek. Two families lived there during my time. One was the Marcus Morton Family (Kids, Leon, Levon and June), the boys still come to the reunions from around the Mesquite, Tex Area. The next Family that lived there was Jack Watson. They had two kids younger a few years than me.. one boy and one girl. Now go back up to the Schofield Road going North..toward my place on the baseline. about 1/4 mile down on the left and about 1/4 off the road to the west was a family named the Crowell's. Two kids Larry and ??? (a girl). Then mile down the road and about a 3/4 mile East is where the Hefner Family lived. Lloyd Hefner family, 4 kids. Odell, Terry, Mike and a Girl. Before them The Harris Family lived there. 3-4 Kids, Bobby Harris, Barbara Harris and I believe 2 more. Then about 1/4 mile further north was Uncle Bill Stoll. Emma, Elsie Stoll Hoover, Vernon (Mary Ann), Louella Stoll Hall. Then 1/2 mile north just pasted the Schofield Cemetery lived Henry Stoll family. They moved to Arapaho and later Calif. in the very early '50's. Jurhee and Billy. Then the road dead ends at the Baseline. AT that intersection is where we three caught the bus. Our home was less than 1/4 mile East on the North side of the road. That was the original home place of the Stoll family. Now go 1/2 mile west on the base line....if you go 4 miles north that is where the Horse Creek School was. Dad's land was on both sides going north first mile or so. Now Continue on west on the Baseline. The first house you came to was on the left side-south side (way back). It was Where Charles Welch family lived. He still attends the reunions. There were some other families that lived there also but it's foggy..I know the Wylie Family lived there also. Continue West on the Base line the next house about 1/3 mile down on the north side is Uncle Jake Stoll. Kids... Janell, Paul Wayne, Gary. Then continue west on base line 1/5 mile (an intersection) go about 1/2 mile North and that was the Home of Uncle Ben Stoll. Kids ... Kenneth, James, and Marilyn. James and his son and wives still live there. Lyndle. Now during my years there was not another stop for a long ways going west to Manitou. Houses along the way 1/2 either side of the road were: Sherman Woods, Stillman, Floyd Neugerbauer, George Neugerbauer, Newmeyers, and then Duane & Annrene Cardwell's. Please do not publish this mess.... I am really pushed for time but wanted to get you at least a little info. By the way, you mentioned the Phillip Stolls, they lived much further East on the base line and went to Indianhoma. The Bus Drivers I remember in order. J M Woods, Walter Fisher, Maybe Les Hogue, Wally Haight etc.